Researchers in Shark Bay, Australia have identified tool use and cultural transmission of the tool use in dolphins. 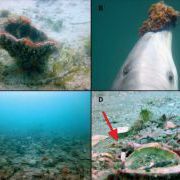 The scientists observed some dolphins occasionally pulling basket sponges from the sea bed and using them to cover their snouts as they foraged for food on the sea bed. The sponges presumably provided them protection from the rocks and shells on the sea bed. However, it wasn't known why the dolphins bothered to forage there. The research team now report that dolphins perform this activity to catch fish living under the sand's surface. The fish scared out of hiding by sponging typically do not contain a swim bladder, a gas-filled organ used to control buoyancy. The lack of a swim bladder has a major effect on the fish's density, making them almost undetectable by echolocation, the normal way a dolphin would locate fish. In addition, fish lacking a swim bladder are typically a rich source of nutrients, balancing out the extra effort required in using tools to locate them. The sponging behaviour is mainly observed in females, possibly due to the pressure of caring for their calves for a number of years. By sponging, the dolphins are able to reliably catch food with no known competition; only spongers can find the fish and not even the human fishermen in the area were aware of them. This is also an example of cultural behaviour as it is believed to have started with just a single female. The dolphins studied using the sponges were all related to each other and living in a single group, meaning that the behaviour was taught to daughters by their mothers. Presumably sons also learn the technique, but the differences between male and female social lifestyles in dolphins make the foraging unworkable for males. First they build tools, then they build advanced weapons and before you know it they're the dominant species. And yet somehow, they're still smarter than humans. After reading the whole thing, the thing that still sticks out in my mind is that Australia has a Shark Bay. Like, for real. Oh noes, Planet of the Dolphins!